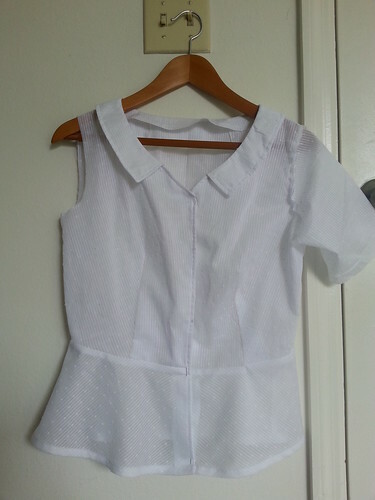 Sew Festive Handmade: Sartorial Saturday: Colette Hawthorn - almost done! Sartorial Saturday: Colette Hawthorn - almost done! Colette Hawthorn - almost done!, a photo by Sew Festive on Flickr. Today I'm working to finish up several clothing items that were languishing half-finished. I've already added the peplum this morning and completed all of the edgestitching, so now I need to figure out if I want sleeves and then install some buttonholes. Side note: I've never used the buttonhole function on my current sewing machine, so I'm a little terrified! Next item to finish? My Victoria Blazer! Can't wait to see it all done! !